CTS small case 17mm 250k audio taper potentiometer. 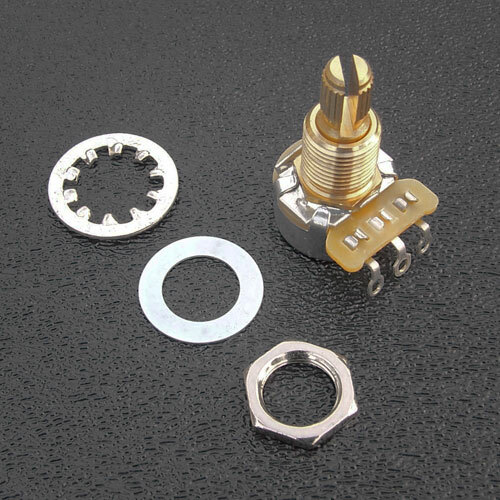 Can be used for typical guitar electronics or specialized circuitry where the larger potentiometers just won't fit. The slightly longer threaded bushing on this potentiometer is perfect for pickguards thicker than 0.090". CTS 250k 10% Audio Taper Potentiometer. 6mm (0.236") Split Shaft - Fits Standard Fender® Knobs. Includes Nut, Locking Star Washer And Dress Washer. For Tone Or Volume Controls.